New Delhi : In a shocking incident, a French woman's face expanded and started to look like a light bulb after applying hair dye. The use of hair product resulted in a near-fatal allergic reaction to a chemical which is generally present in dark-colored hair dyes. Estelle, who is 19-year-old claims that a chemical in the dye called Paraphenylenediamine (PPD) caused her allergic reaction. She only tested a small amount of the product, her scalp almost “immediately” became irritated after application, she reportedly told the French publication. The swelling began shortly after. 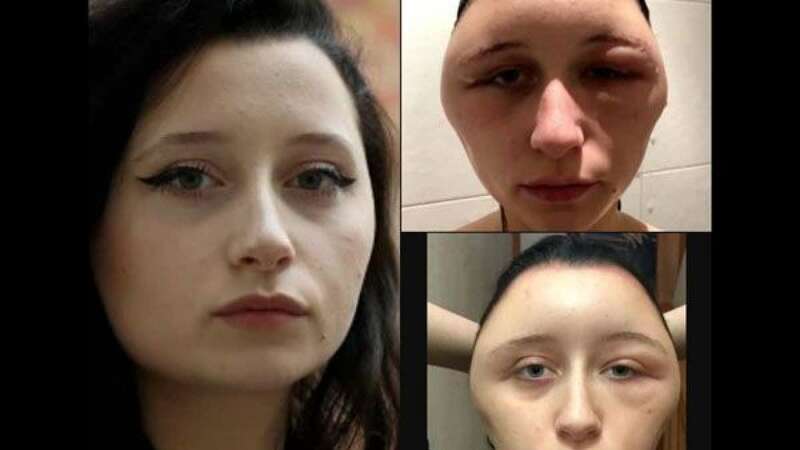 She soon took an antihistamine to help with the swelling and irritation and surprisingly, the next morning, she found her head already enlarged to 24.8 inches compared to an average 22 inches. Her tongue also swelled, she added. Estelle told Le Parisien, Yahoo Lifestyle reports that she could not breathe even. "I has a light buld head", she said. The woman was admitted to the emergency room where she was given adrenaline dose. After an overnight stay and care in the hospital, she recovered a bit and her swelling has gone down. The PPD chemical is commonly found in dark-colored hair dyes and makeup, as well as henna tattoos, according to Yahoo Lifestyle. An allergic reaction to the chemical can cause “fatal complications,” such as the breakdown of muscle tissue, known as rhabdomyolysis, respiratory distress and renal failure, among other side effects, according to report in the Journal of Research in Medical Sciences.